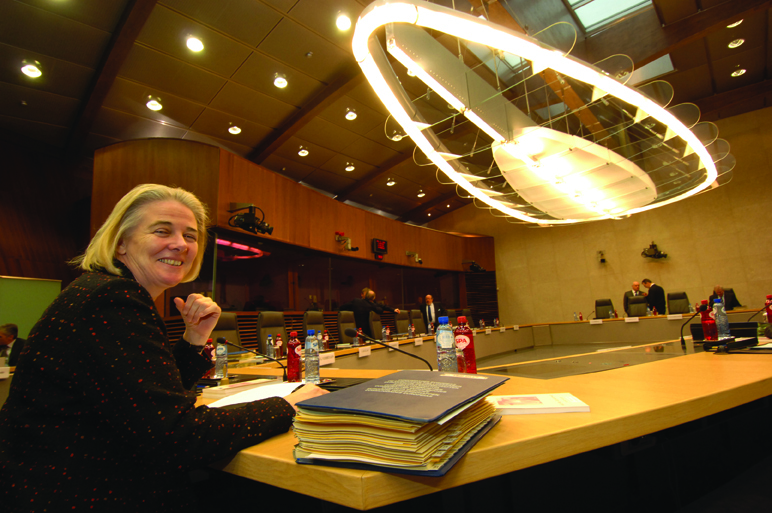 Catherine Day is the current Secretary-General of the European Commission. She followed another Irish person, David Sullivan, into the role, to the chagrin of some of our European friends. Day has been in that position since 2005 during the whole of the Barroso Commission, having previously been the Director General for the Environment. Catherine Day was born in Dublin in 1954, brought up in Mount Merrion and educated at Mount Anville private convent-school. She has a BA in economics and an MA in International Trade and Economic Integration from University College Dublin and went on to be the loan officer at the Investment Bank of Ireland in 1974. The following year she became EC Information Officer at the Confederation of Irish Industry. Much of her ethos seems to have been forged by this time. She joined the European Commission in 1979 and the cabinet of Ireland’s Richard Burke in 1982 at the age of 28, staying for a term with his Irish successor, Peter Sutherland, competition commissioner. She then transferred to the cabinet of the UK’s Leon Brittan, a Tory, for two terms, when he was responsible for external economic affairs and trade policy. She returned to work for him in 1996 as director for relations with third-world countries. Day became deputy director in Chris Patten’s external relations where she was deeply involved with the enlargement of the Union from 15 countries to today’s 27. After this, Catherine Day (not to be confused with Estonia’s national holiday, ‘Catherine’s Day’) was part of a reshuffle among the Commission which promoted liberal economic reformers. She had become notable in the Commission for taking on French state-aid policy. Before becoming head civil servant she served as head of the Environment DG. Apart from her short fuse, colleagues speak well of Day. Despite Day’s workaholism in the Commission, there’s no shortage of people willing to describe her as “adorable” or “clever” or “helpful”. Inevitably she is reputed not to suffer fools. Although she proudly declares she has no hobbies whatsoever, she apparently enjoys going out for meals and concerts. While well disposed to the sort of Christian Democrat policies that prevail in Ireland – and at one stage having been one of the forces that wanted mitigation of the Commission’s stringent approach to EU environmental-law breaches, she is also – as the whole Commission is obliged to be – independent of national bias. No doubt in this spirit of impartiality in 2011 Day noted that “people do not believe the Irish are good Europeans anymore”. She said “the perception is that the more prosperous Ireland became, the more arrogant it became, and the less it engaged. It shouldn’t be a fair-weather engagement”. Equally brutally she showed little sympathy for Ireland’s self-inflicted predicament: “I understand that Irish people feel the burden of debt is enormous and wish that they could just shrug it off, but life isn’t that simple”. Recently she has found herself repeatedly embroiled in controversy with some who purport to defend the public interest. For example, she intervened twice in 2012 in the regulation of tobacco products, delaying strengthened EU legislation on the subject. She sent a letter to Paola Testori Coggi, Director General of the Commission’s DG for Health and Consumers, which “could easily have been sent by a tobacco industry representative”, according to Germany’s Der Spiegel magazine, which investigated the resignation in October 2012 of John Dalli, former EU Commissioner for Health and Consumers. The affair ultimately led to more than 150 questions from MEPs. Appearing before the European Parliament in January, Day sought to justify her interventions on the basis that she did not want the text of the revised Tobacco Products Directive to leak. She has since turned her attention again to environmental policy. In recent weeks, several stories have leaked to the EU press regarding Day’s personal interventions in respect of EU environmental policy, an area she knows well after that spell as head of the Commission’s DG Environment from 2002 until 2005, during which she drew the enmity of many environmentalists. In March she blocked a legislative proposal to cut the use of plastic bags, restricting Environment Commissioner Potočnik’s room for manoeuvre to bring forward a green paper on plastic waste. She is also said to be behind the delayed publication of a long-expected green paper on the sustainable management of phosphorous, and reportedly wants the Environment Commissioner to postpone proposals on ‘green infrastructure’, on moving beyond GDP as an economic indicator, and on environmental inspections. Media reports suggest Commissioner Potočnik is willing to fight for the green paper on phosphorous, at least. As Secretary General, Day has the practical power to block proposals from any part of the Commission by preventing or delaying them being put to inter-service consultation. Day is said to believe that the Commission’s work should currently be focused on growth and the euro, with a spokesperson commenting that the Commission is “often obliged to prioritise between the many proposals made by all of the Directorates-General”. Dutch MEP Gerben-Jan Gerbrandy said many in Brussels were unconvinced by the argument that this is not a good time for new environmental measures. Stronger environment policies are “especially needed now, when we are trying to refocus our economy”, he has said. In early March, it was reported that Day had been behind the European Commission’s decision to appeal rulings of the EU’s General Court which highlighted deficiencies in the EU’s legislation on access to justice. NGOs reacted with fury: “It is pure hypocrisy that on the one hand the Commission proclaims that 2013 will be the European Year of Citizens and at the same time launches appeals against Court rulings that would give those same citizens greater rights to challenge violations of the law”, said the Secretary General of the European Environmental Bureau which tracks Commission environmental policy, Jeremy Wates. “This comes on the heels of the Commission’s equally disgraceful attempts to weaken the transparency requirements pertaining to information held by EU institutions”, he added. “Is this a case of Catherine Day being more spinned against than spinning?” asked a spokesperson for An Taisce at the time. “We don’t think so: her damaging influence over areas such as health and the environment – issues of central importance to Irish and EU citizens – are of major concern to us, and they are making her position increasingly untenable”, he added. For the moment, however, zeal for the environment is not a prerequisite for the Commission Secretary-Generalship. Perhaps some day.